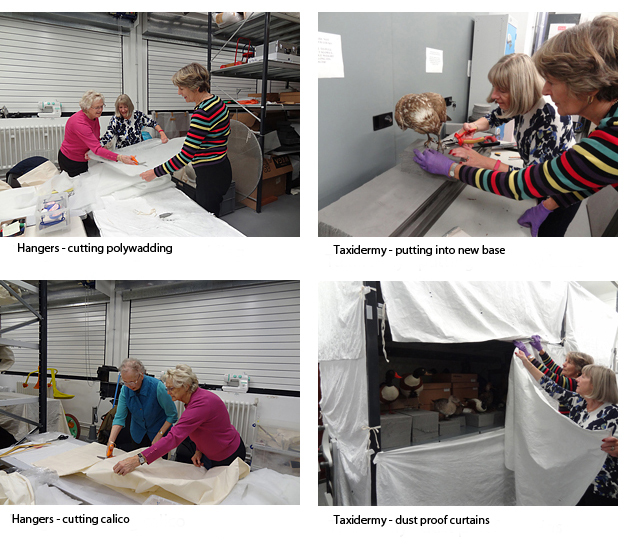 Over the last six months the Herbert group from The Arts Society Royal Leamington Spa completed a project to curtain off taxidermy shelves to allow dust free open storage of the collection. Following on from this, two members have been removing specimens from their boxes and securing them into foam stands. The taxidermy is now much more accessible and better stored. Over winter the whole group had a change of scene and worked at the Herbert’s sister museum, Coventry Transport Museum. In the recently redeveloped museum many of the bicycles and motorbikes are on open display and were proving too much of a temptation to touch. The group designed and created clear saddle covers for the most vulnerable bikes and had a lot of fun working with the very noisy and squeaky plastic material. Any spare time has been filled up with the mainstay of work for the museum by The Arts Society group – padded hangers. We now have a lovely set ready to use for the existing collection, or new donations. A group of volunteers from The Arts Society Royal Leamington Spa have been working at Leamington Spa Art Gallery & Museum since 2004. 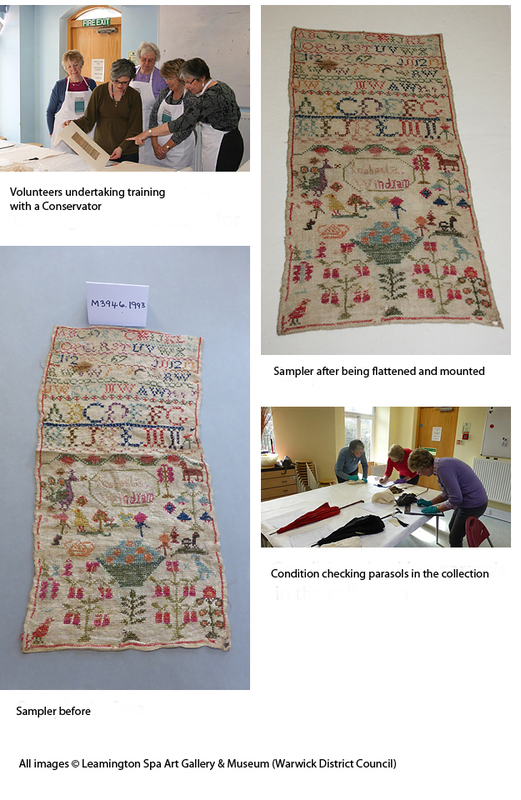 They have undertaken a number of collections care projects, most recently condition checking and mounting 18th and 19th century samplers. This involved using glass weights to carefully flatten the samplers and creating padded boards to sew them on to. A selection of the samplers were then displayed in the museum. The group are now condition checking and repacking a small collection of parasols. They are making detailed records of the condition of each parasol, taking photographs and making bespoke boxes to store them in. After this, the volunteers will make calico covers and padded hangers for items in the costume collection. Before undertaking new projects, the volunteers receive training and are given guidance throughout. We are always happy to welcome new members to the team and three new recruits recently joined us. If you are interested in joining the volunteers at Leamington Spa Art Gallery & Museum, please contact our Volunteer Co-ordinator. We enjoyed an interesting and amusing lecture on Capability Brown on the 4th May. If you would like to read a report on it, it should appear in The Courier of Friday, 13th May. On the 1st June, Mary-Rose Rivett-Carnac will be telling us how the Public Catalogue Foundation came to be established in 2003 to find, photograph and record over 200,000 oil paintings that are publicly owned and in the care of the State, Local Authority and Charitable Trusts. We will hear about the detective work involved, the intriguing paintings discovered and assistance given by NADFAS members. £6 million was raised for this project towards which we, like many others, gave one-off donations. It took 10 years to complete and some 30,000 site visits were made. The artworks are now recorded in books, each showing the paintings in that county. There is a waiting list of people wanting to go to Boughton House. However it is always worth putting your name on this list by contacting Shirley Skinner, as unforeseen circumstances can arise. Because we are currently having difficulty in finding a suitable book on Chagall, the member with the winning raffle ticket at the AGM may receive another art book. Further to my comment last month that RLSDFAS valued relationships with other local arts organisations, perhaps I should make it clear that this does not relate to sponsorship. There may be information we can share and ways in which we can help each other. For example, we may have a lecture that would greatly appeal to members of another organization and we would consider inviting them to come as guests.